It’s Memorial Day Weekend, eeeeee! Exactly one year ago yesterday, James & I got engaged – so cool! To celebrate, we headed to Chicago for a mini-Johnson family reunion, which was a total blast. This year we’re spending the weekend in Dallas doing lots of fun things with friends. Last night we were at a benefit concert hosted by the Cones & their friends from their church community, the Kellums – The Black Frames played (and James got to do a cameo on his fiddle, so fun!) and the proceeds of the event benefitted Touch A Life. Does it get any more awesome than that? Tonight we’re having friends over for a backyard barbecue, and on Sunday we’ll meet more friends for dinner at Hopdoddy & a game night (where a few rounds of Cards Against Humanity will definitely be involved). I plan to soak up the sun on Monday and convince James to take me out for a Mambo Taxi (or two). Three cheers for three day weekends! 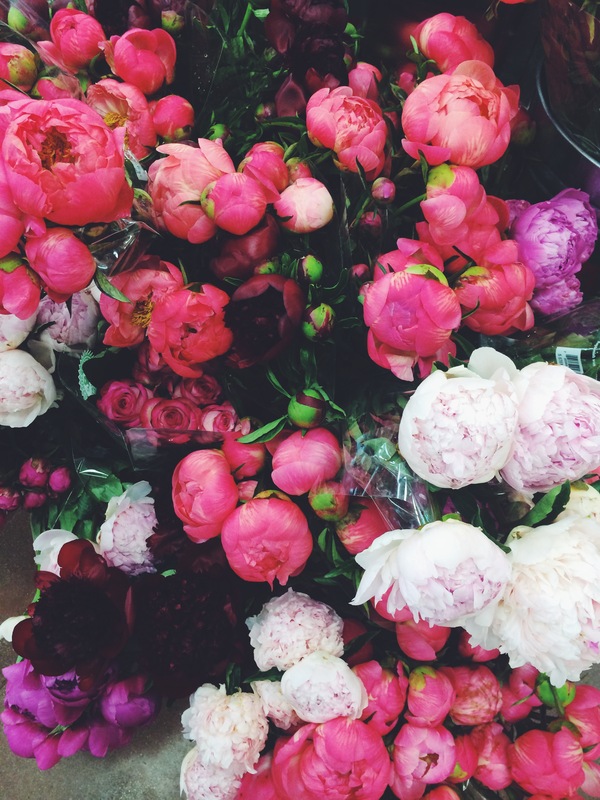 Everyone (including myself, clearly) has been posting gorgeous pictures of peonies & I don’t blame them – they’re in season right now and they make me so happy! I picked some up at Trader Joe’s for our house and my office and I need to read up on how to care for them so they last for as long as possible. I am obsessed with Daily Greens juice (made in Austin but widely distributed in Dallas, even at my yoga studio) – I drank a bottle of the Harmony juice every day while we were in Austin for our wedding festivities, even on the big day itself! When I read that they are opening a juice bar where they’ll also serve cocktails, I nearly fainted – what a delicious concept. There are so many good new restaurants cropping up around town. I want to try Pecan Lodge, Top Pot Doughnuts, and Stock & Barrel. Wouldn’t it be fun to host a build-your-own sliders party? These sandals! Swoon. So perfect for summer!